Then navigate to your Home Directory (H Drive) My Documents folder. FileWay Updated to version 5: March 2018. Select and double-click or right-click a folder or file to navigate, download, view in the browser or use other options. Action - view a file online, open a folder, copy, move, rename or use other options. To edit or make changes to a file: download and save the file to your computer, edit and save again, then upload the edited file to FileWay. If you don't want to make any changes to the file, use the View option to quickly view the file in the browser. Select the file, then select View by a right-click or select View from the Actions button. 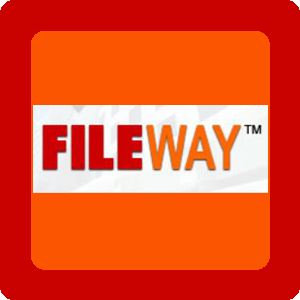 If you want to upload a file using FileWay, select Upload on the FileWay toolbar. Upload File window opens. Click on the Select button to open Windows Explorer and browse to the file you want to upload, then click Upload. To add multiple files, click the Add button and repeat. Files cannot be saved directly to your home directory when using FileWay, but you can upload and download files. For example, when off-campus: you can login to FileWay, download and save the file to your personal computer or a USB drive, make changes to the file, re-save the file, and upload the new file to your home directory. In order to edit files that are saved in Fileway, you must first download and save the file to your personal computer or USB drive. Right-click on any file listed in FileWay and select Download, OR select Download from the Toolbar. Save the file to your personal computer or USB drive. Open the file in the associated program and make any changes. For example, if you have a .doc file, open and edit the file using Microsoft Word. Save the edited file again to your personal computer or USB drive. To upload an edited file back to FileWay, select Upload on the FileWay toolbar. Upload File window opens. Click on the Select button to open Windows Explorer and browse to the file you want to upload and then click Upload. If you would like to add multiple files, click the Add button and repeat the upload steps. Using your browser on an iPhone or iPad, you will be able to access your files and folders and FileWay features - except for download and upload. To upload or download files, use the FileWay app..
Access your files and folders through your device browser, much like using a computer. There is not a FileWay app for Android. You can email a link to a file or Drop Folder to yourself or another person. The link can have an expiration date. AttachLink allows users to email file attachments as links instead of sending the actual files. AttachLink Drop allows users to create a Drop Folder to which authorized users may upload files. To authorize users, the owner of the Drop Folder simply sends them a link. FileWay will then generate a temporary User ID and password for each recipient and email that information separately. The recipient will get an email titled: Temporary Login ID for: fileway link along with information about how to access the file or dropbox. To access the files or the drop folder, the recipient will click the link, login with the temporary User ID and password.